In the wake of the work accomplished through the Truth and Reconciliation Commission of Canada and subsequently through the National Centre for Truth and Reconciliation in Manitoba, there has been a push at the public and governmental levels to redress the legacy of residential schools upon Canada’s indigenous communities and to advance the process of reconciliation between these communities and the provincial and federal governments. In relation to this, there has been an increased recognition in the public sphere regarding how Canada’s indigenous communities have had their perspectives and experiences misrepresented or excluded from predominant institutional and media discourses. As a result, indigenous artists such as Marina Hulzenga are creating artworks that prompt people to reconsider their perspectives and attitudes towards Canada’s indigenous communities. Indeed, Hulzenga exposes the biases inherent in “Western” mappings of space as an abstract process as they suppress and erase the presence of the numerous indigenous communities that are a significant part of this province and its history. Her work reinscribes the presence of the province’s 141 First Nation reserves, all of whose presence has been suppressed and erased in mainstream representations of Alberta’s land. In doing so, Hulzenga articulates a more complex understanding of Alberta’s geographical space that destabilizes its provincial borders, encourages a more fluid conceptualization of that space, and situates it within the context of indigenous oral narratives and communal memories that give it meaning. The installation itself includes a large map of Alberta hanging on one wall that shows all of the indigenous reservations and settlements with their respective boundaries. Complimenting this large map are some white rectangular boards that each depict the geographical shape of a specific indigenous community and includes a label that identifies each community’s name with its geographical coordinates. These boards are arranged in a row and run along the perimeter of two walls close to the baseboard. The juxtaposition of these two elements—the large map and the indigenous communities that are represented individually on white boards—draw attention to the problematic process of mapping a territory and the ways in which it can privilege a particular perspective upon that space. By drawing attention to these indigenous communities, Hulzenga deconstructs our understanding of Alberta’s map and forces us to consider what maps may not show or emphasize. Conventional maps of Alberta that people may be accustomed to seeing in sources such as geography textbooks, driver guides, and tourist guides will tend to depict the province’s major roadways and elements related to the land’s physical makeup, such as the water features, elevation levels, and so on. Indigenous reservations and settlements have not been consistently represented and the political borders that define Alberta as a province take precedence. As a result, the indigenous communities’ histories are also omitted as they are inherently tied to the land upon which they define their identities. These omissions are made even more apparent by Hulzenga’s inclusion of a historical map of Alberta in her installation that also do not identify these communities. In relation to this, the arbitrariness of reservation boundaries is highlighted by Hulzenga’s depiction of the Enoch Cree Nation reserve’s traditional land map alongside the chronological shrinking of their territory. As a result, Hulzenga posits an alternative understanding of space that is more fluid and defined by the cultural communities’ historical boundaries and experiences rather than by the political borders artificially imposed by the Canadian nation-state without acknowledgement or consideration of the historical context that has preceded them. Furthermore, these spatial representations of Alberta omit the narratives that give them meaning. Hulzenga has collected oral narratives about indigenous peoples’ memories of their childhoods growing up and how it is strikingly different from where they live now, which people can listen to by putting on one of the headphone sets, each of which are tied to a small tree. As a result, this conveys an understanding Alberta’s territory as not only a physical space but also a discursive space that is given meaning through narratives and storytelling. The individual anecdotes emphasize how the land is not simply a physical, abstract entity but rather something that has cultural, ancestral, and personal significance and that is given meaning through the retelling of stories in the present. Their stories may convey regret or a sense of loss around the fact that they can never return to the ways things were before in their respective communities. However, at the same time they convey a sense of humour to emphasize that these communities are living, breathing entities. Related to these narratives is Hulzenga’s inclusion of selected drawings from Enoch Cree nation members who have been asked to draw a map of their reserve from memory in one minute. The drawings range from attempts to create a representation of the reserve that accurately identifies key roads and landmarks to those that are more interested in creating a suggestive rendition of their community that identifies markers of personal significance. The results of this seemingly simple exercise reveals the complexity of meaning-making that occurs in relation to a geographical space and the fluidity and ambiguity inherent in this process, since one person may derive significant meaning from a particular place whereas another person may not. Another element of the exhibit are the aerial photos of Churchill Square and other locations around Edmonton with the tile and gravel components outlined in red. For Hulzenga, the presence of gravel takes on a cultural meaning as it signals the shift between the border of one territory to another. These illustrate how the physical materials that make up the land themselves are endowed with meaning, which is something that may not be readily apparent to people. The only drawback to this installation is that its format and spatial layout are perhaps limited by the gallery space’s size and shape. Had there been more room available, it appears that Hulzenga could have spread out the different elements of her installation a bit more so that people could navigate around and view it more easily, such as the white rectangular boards that depicted the specific indigenous communities. Nevertheless, the impact of Hulzenga’s work will still be felt by the people who have viewed it. As a whole, Maria Hulzenga’s exhibition offers an important intervention into the discourse of truth and reconciliation. The act of mapping is an important part of this dialogue as it is tied to the history of indigenous communities, who have had their traditional lands systematically taken away by the government and reduced to a fraction of its original size on reservations. As a result, Hulzenga’s work prompts people to become more aware of and acknowledge this history that indigenous communities have experienced and that continue to have lasting effects to the present day. A previous version of Maria Hulzenga’s Liminal Spaces had appeared previously at last year’s The Works Art and Design Festival, but with a different spatial arrangement and in a different venue. For more details about her artistic practice, visit her official website at http://www.marinahulzenga.com. Complexity and multi-faceted: these are two words that point to the motivations behind Emmanuel Osahor’s art. Having graduating from the University of Alberta’s BFA program in 2014, Emmanuel Osahor has developed an artistic practice that is informed by two distinct yet interconnected threads: (1) a desire to explore complexity and challenge people’s assumptions of the work that they are looking at, whether this is in terms of the work’s subject matter, medium, or approach to the topic; and (2) a desire to grapple with utopic ideas. In his reflections on problems that we face today, Osahor comments that his work is “trying to deal with my own frustration at the impossibility of having a quick fix.” Discrimination, marginalization, and homelessness are entrenched problems in our communities today that we may desire to address quickly, yet such is not the case in reality. As such, his art becomes a way to negotiate his own thoughts on these subjects as well as a means to challenge his audience’s perceptions of reality in the process. However, it is important to avoid viewing Osahor’s art through an activist framework as this misses the nuances of what he has set out to do in his art. He regards the role of art as a catalyst for reflection, dialogue, and empathy, all of which can provide the conditions for changing people’s perspectives and attitudes. For Osahor, the ability of art to generate empathy is powerful and can enable people to be more open to change. The evolution of Osahor’s art can be traced back to a number of influences that connect with his educational and personal background, coupled with his awareness of societal issues that developed from his immigration to Canada and from his artistic collaborations with cultural communities and organizations in Edmonton. Although he immigrated to Edmonton in 2010 for educational reasons, Osahor has since made Edmonton his home. 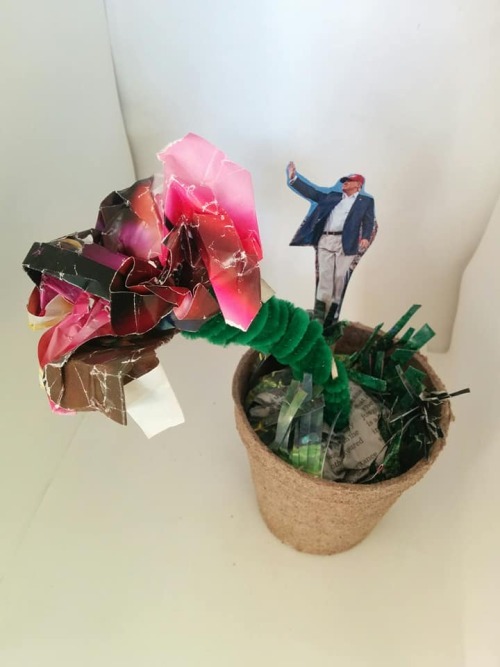 After finishing his BFA program with a specialization in painting and printmaking, he worked on some projects that reflect a confluence among his desire to draw upon his personal experiences and his interest in engaging with issues of social and political relevance. His initial projects dealt with personal subjects that he used as a starting point to explore broader concerns. In “The Distance Between Us” (2014-2015), Osahor explores questions about peoples’ memories, their relationship to the past, and the ways they construct narratives to make sense of that past. The starting point for his considerations are some old family photographs, from which he drew his inspiration. Similarly, his work “And Then My Hands Shook” explores the topic of violence of contemporary society by reflecting on a variety of images that range from personal photographs of life back home to images found in newspapers, through which he reflects on the lingering effects of civil war in Nigeria as well as the pervasiveness of violence in a broader, global context. His subsequent projects, such as “Green Pastures” (2016) and “My Journey,” (2016) focus on engaging with the local community and documenting the experiences of immigrants and newcomers to Edmonton through art. Intent on giving voice to their perspectives, Osahor affirms that these peoples’ experiences tend to be unacknowledged or unappreciated by the public because of their skewed assumptions about immigrants’ intentions for coming to Canada as well as the nature of their experiences once they have settled here. Far from being a smooth transition to a new country, immigrants are often leaving their community, livelihood, and a whole way of life behind in order to come to a country that is completely foreign to them. Such a disjuncture in their lives is something that Osahor feels is not recognized enough. His own experiences as an immigrant have also served as a catalyst for him to explore these issues. When he was a new immigrant in Canada, he had a particular preconception of Canada that was utopic and not really grounded in reality. However, he gradually came to realize that the public was unaware of the actual lives of newly settled immigrants in Canada and the actual conditions of what Africa is like. He observed that Canada’s mainstream news coverage of Africa was often negative or otherwise did little to cover it at all. While in school, he also volunteered with iHuman and later worked with them for a period of time after graduating in 2014. He then began working with photography as a medium and began taking a lot of street photography to gain experience. From working in these mediums of painting, printmaking, and photography, Osahor grew to appreciate the strengths of each medium as well as the possibilities that they provide. Indeed, his attraction to photography arises from his recognition that he can challenge people’s perspectives and assumptions about the genre, through which he can explore subjects that are important to him. For example, his River Valley project in 2017 explored the river valley and the complex meanings attached to it. Although the river valley can be regarded as a sanctuary or oasis in the middle of Edmonton, it has different meanings for people who visit it and for the homeless who make their home there. As such, this highlights the complexity of what a space can mean: it can be an escape, but it can also be a home. 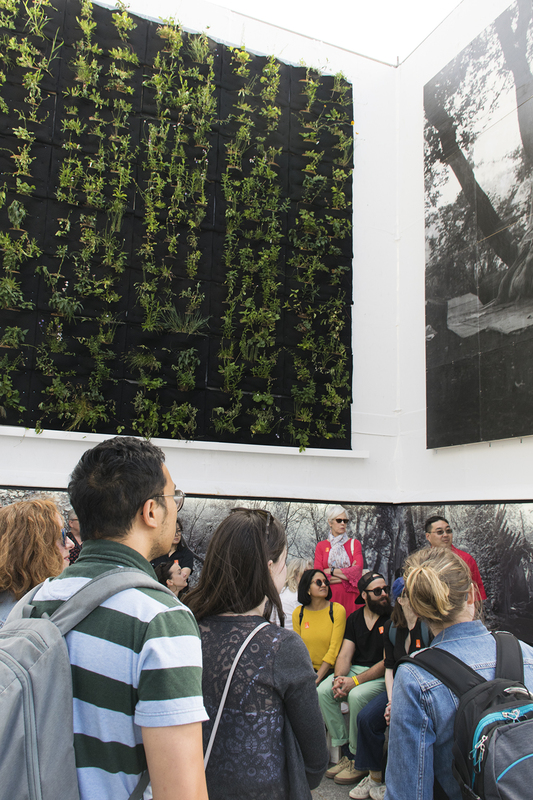 At this year’s The Work Art and Design Festival, Osahor will have a 24-foot high installation that will feature a selection of photographs from this River Valley project as well as a living wall with plants that will reflect those that grow in the River Valley. This is an extension of his previous work as he continues to challenge people’s perceptions of what they are seeing as well as the possibilities for making use of a space. His hope is that the installation will encourage people to pause and reflect in the midst of a media culture that is saturated with images. The light boxes at In Search of Eden light up in the evening on Capital Plaza. Patrons can check out Osahor’s work at Capital Plaza, the central site of this year’s festival. To learn more about Emmanuel Osahor’s art, more information is on his website at https://www.eosahorart.com.